Apple cofounder Steve Wozniak gave his two cents on the iPhone 6 in an interview with CNN Money this week. 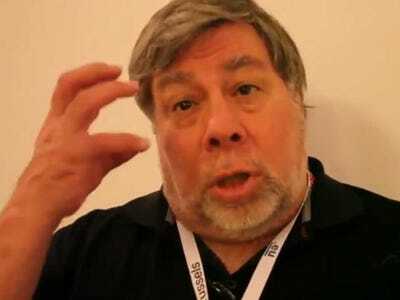 Wozniak echoed Apple fans who have been waiting years for the company to release a bigger smartphone. But the Apple cofounder is missing an important point. Apple is almost never first-to-market in any product category. Their strategy is to come up with dramatic, generational improvements to products that others have done not as well. The iPod wasn’t the first MP3 player, but it was the first that lots of people wanted to use thanks to features like the scroll wheel and tight integration with iTunes and (later) the iTunes Music Store. The iPhone wasn’t the first smartphone. The iPad wasn’t the first tablet. That strategy works for Apple. People who wanted larger phones bought Samsung phones (or occasionally other Android phones) when they had no choice. Now, many of them are choosing Apple instead — iPhone 6 sales are going crazy. This isn’t the first time a high-profile tech figure has made a comment like Wozniak’s. In September, Google chairman Eric Schmidt made a similar remark on Bloomberg TV. Schmidt and Wozniak are essentially making the same argument. Surely Apple would have sold some phablets if it had come out with them in 2011, but they wouldn’t have been as good as the iPhone 6, because the iPhone platform and apps at that time were optimised for smaller screens. So they wouldn’t have come close to the sales Apple is getting on the iPhone 6 and 6 Plus. Honestly, Charlie, we could have done a larger iPhone years ago. It’s never been about just making a larger phone. It’s been about making a better phone in every single way. And so we ship things when they’re ready. Apple doesn’t want to be first when it can be best. That strategy seems to be paying off on Wall Street. Apple’s stock hit a record high this week.